Our fur friendly Tasting Room is located in downtown Calistoga, Romeo Vineyards & Cellars offers a unique wine tasting experience set in breathtaking gardens. The Jasmine and Rose adorned arches lead you through the oasis of flowers and plants to the restored 1800's Carriage House - Romeo's tasting room. 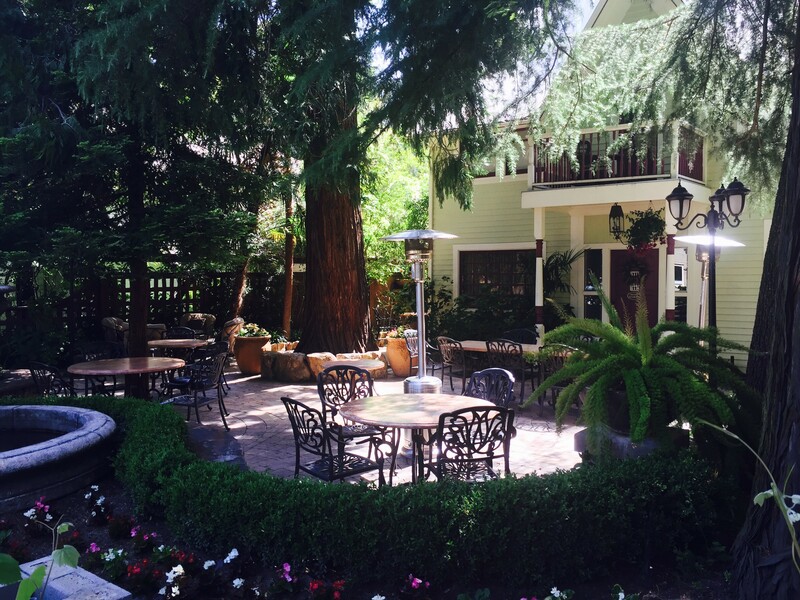 Our secret gardens are shaded by century old Giant Redwoods and Cedars making it the perfect spot to enjoy a glass, or open a bottle and share with friends and family. Tastings - for parties of 6 or more call (707) 942-8239. Choose from a selection of tastings from $20 for 5 x 1oz pours - the purchase of wine compliments the price of a tasting. We pride ourselves in the fact that our team at Romeo welcomes 'FTT's' (First Time Tasters) in a fun fact way. We love the opportunity to guide you through the nuances of wine tasting - please believe us when we say there are very few people that have the ability to recognise what they can smell or taste - we will give you the basis for you to look like an expert in every tasting after you visit us! Enjoy a glass or bottle of wine in our stunning shady secret garden bursting with flowers of every kind - don't worry if you dont know which wine you prefer - try before you buy - our staff will always help you find your perfect wine.